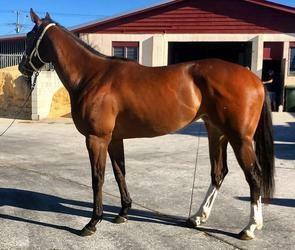 Neil Dyer Racing :: NEW ADDITION TO STABLE READY TO GO! Lillie Evangelene is a 4yo mare by REAL SAGA, sire of CANDELARA, REAL SURREAL and SAGARONNE. She is out of 6-time winning mare, LILLEELAVEE (by SPINNING WORLD (USA)). Lillie Evangelene has had 9 starts. She has had 1 win at Doomben on July 12th and has placed at the Sunshine Coast earlier this year. I have attached the replay of her Doomben win. She is currently in full work in Darwin and is ready to go on with. Standing at 16.3hh, she is a big, solid mare with a good temperament.